The Allbritton Art Institute presents lectures by distinguished art historians and artists from throughout the United States and from abroad. Students, faculty and the wider Baylor community enjoy these opportunities to hear lively discussions of topics in 18th-century, 19th-century, 20th-century, and contemporary art. In the fall of 2018, the Institute hosted Nicole R. Myers, the Lillian and James H. Clark Curator of Painting and Sculpture at the Dallas Museum of Art. Dr. Myers lectured on the life and work of Berthe Morisot. As well, she spoke of the artist within the context of the monographic exhibition of the artist's work that she co-curated titled, "Berthe Morisot, Woman Impressionist". In the fall of 2017, the Institute hosted internationally acclaimed, category defying artists, Doug and Mike Starn and art critic Jason Kaufman for the Allbritton Art Institute Biennial Artist Conversation. In the fall of 2016, the Institute hosted the world's leading authority on Impressionist artist, Claude Monet, Dr. Paul Hayes Tucker. 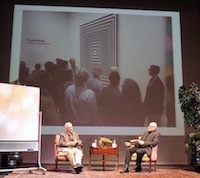 In the fall of 2015, the Institute hosted art critic, Jason Kaufman and world-renowned artist, Frank Stella for the Allbritton Art Institute's Biennial Artist Conversation.